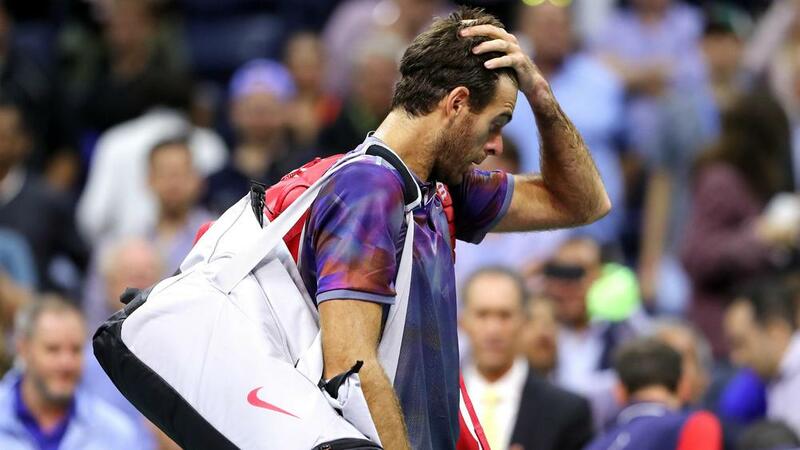 Juan Martin del Potro expressed his anger after he missed out on a spot in the US Open final following a four-set defeat to top seed Rafael Nadal. After saving two match points against Dominic Thiem in the last 16 and upstaging 19-time grand slam champion Roger Federer in the quarter-finals, 24th seed Del Potro lost 4-6 6-0 6-3 6-2 in New York on Friday. With Andy Murray, Novak Djokovic, Stan Wawrinka, Milos Raonic and Kei Nishikori absent from the year's final major, the draw had opened up for Del Potro and others. However, the 2009 US Open champion was unable to move into Sunday's decider with first-time finalist Kevin Anderson, despite a sensational opening set as he crumbled against the world number one. "I think it was the first time to be dominated by him, but it's the first time we play without a good backhand on my side," Del Potro told reporters. "But he played so smart the second set, the third, and the fourth. "To be honest, I'm angry to lose a chance like this, but maybe tomorrow, after tomorrow, I will be calm and see how big the tournament was for me." "Rafa just play even better the last three sets of the match, and I couldn't hit my backhand as good as I did in the beginning of the match," he added. "He's a lefty player, so he couldn't find easily my left side of the game. He played so smart from the second set till the end of the match. He was dominating every time of the match. He played well." Del Potro had battled illness heading into the final-four encounter, having struggled against Thiem and Federer. "I was just tired. I been exhausted after Thiem match, Roger match. I had flu during the week," the 28-year-old said. "So I had many problems before this match, but I was very motivated to play the semi-final in my best tournament. "I think he just play better than me. He deserved to win, and I did all my best, all my effort to survive this match, but I couldn't do well."